Due to Inclement weather forecast the Funeral will be postponed until Friday, April 12, 2019 at 10:30 AM at Beautiful Savior Lutheran Church, 402 S. Baytree Ave, North Platte, NE. Visitation will remain as scheduled on Wednesday. 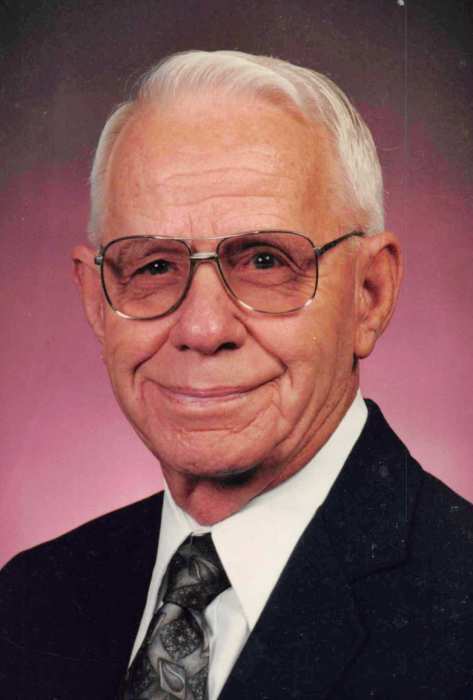 Glen Golter, 97, of Brady, NE, died April 4, 2019 at Hilltop Estates in Gothenburg, NE. Glen F. Golter's favorite saying was "use your head, a little common sense will carry you a long way!" Glen came a long way, as he had celebrated his 97h birthday. Glen Fredrick Golter was born to Fred and Lillian (Knappert) Golter on the family farm three miles north of Arapahoe, NE on September 24, 1921. He had an older sister Alene and two younger brothers, Lloyd and Gerald. Childhood memories include receiving a penny from their dad for each pile (shock) of wheat he and his sister Alene put up. His dad would also give them 10 cents each Saturday for the "picture show" and a sack of popcorn. They thought they were rich. They survived the Great Depression and the Dust Bowl of the 1930's by delivering milk, selling eggs and farming. Glen attended an Elementary School in Furnas County through the 8th grade. A memory he always shared with his grandchildren was a track meet where he won the high jump in his farm boots over the other boy and his fancy shoes. He didn't have a chance to attend high school as money was needed for the farm so his father sent him to a CCC camp in Beaver City where he was paid $8.00 per month and his parents were sent $30.00 per month for his labor. He worked there for about a year and a half and then went back to Arapahoe to help on the farm. Glen saw a pretty girl pushing a stroller down the sidewalk where she was babysitting and eventually met, courted and married Marjorie Huff on December 12, 1943. All of Glen's friends were joining the Army and he decided he wanted to join also. He enlisted on June 2, 1944 and was sent to Ft. Sill, Oklahoma to basic training and then to California where he was shipped out to Germany. Glen served as a Staff Sargent until 1946. He returned home and took a job with a survey crew from the Bureau of Reclamation to help build the Medicine Creek Dam. He was chosen because of his knowledge of water, windmills and work ethic. His crew went out and put brass caps on locations of land between Moorefield and Orfino. The government was to visit all of the landowners prior to the survey crew's arrival but failed on one occasion and his crew were met with guns. Glen had to do some fast talking and assure the rancher that they were not there to take away his land but to survey it to determine the direction of water run off. This would then determine where to build the dam. One member of his crew was so scared he hid in the hills and would not work so Glen had to fire him. After working for the Bureau of Reclamation for about a year and a half Glen decided that his wife and son needed a permanent home and he applied to Central Nebraska Public Power (Tri-County). He had no electrical experience but they took a chance on him because of his background. In 1952 he moved his family to Jeffrey Lake and lived in a small Tri-County house on the hill by the lodge. He trained a lot of people over the years, one special one Don Abbott, who works now at Stone Hearth. Eventually they would build the main office in Gothenburg where all the water would be controlled by computers and Glen made yet another transition and learned how to operate the new system. He retired from Central Nebraska Public Power in 1986 after 34 years. During these years he and Marge raised three sons: Gary, Bobby and Randy. Living on the lake afforded the opportunities to ice skate, swim, fish, and hunt which was a big part of the family life. Driving to church in North Platte every Sunday was a prayerful time and the boys were not allowed to listen to the radio. He and Marge remained devout Missouri Synod Lutherans. Marge was a wonderful mother and manager of money! Glen and Marge started cleaning carpets to supplement their income and put all three sons through the University of Nebraska. The three boys were all involved in Brady High School sports where they excelled in football, basketball, and track. As the boys all married and had families of their own Glen continued to teach his beloved grandchildren to fish, hunt and love the Lord! Glen and Marge bought a home in Brady and moved from Jeffrey Lake in 1987. Glen loved taking care of his large yard and had a shop built to accommodate his hobbies. They included wood working and tying his own flies. He and Marge headed to Saratoga Wyoming every September to flyfish at a place called Pick Bridge on the Platte River. All three sons would go when they could and it became another tradition, Every Golter is an avid football fan and never miss watching Big Red football. Playing golf was another sport the entire family enjoyed doing together. Declining health forced Glen and Marge to move from their home to Stone Hearth Estates in 2013 and then to Hilltop Estates where the love of his life passed on February 7, 2017. They celebrated 73 years of marriage on December 12, 2016 and Glen loved to advise young people "to kiss every night before they go to sleep and be honest with your feeling." He also told every one to read the Bible everyday and love the Lord like he did. Yes, Glen was a hard working, self-taught man who used his common sense to help him attain many goals in his life and now the greatest goal of all, to be at home with our Lord and Savior. He is survived by his three sons, Gary (Connie) Golter of Hastings, Bobby (Susan) Golter of Brady and Randy (Elizabeth) Golter of Davenport, Iowa, 7 grandchildren, 19 great grandchildren, and 3 great great grandchildren and many nieces and nephews. Glen was preceded in death by his parents, Marge, his loving wife of 72 years, his sister Alene and brother-in-law Wayne, his brother Lloyd and his daughter-in-law, Julie Golter. Visitation will be held at Blase-Strauser Memorial Chapel, Gothenburg, Nebraska; Wednesday, April 10, 2019, 1:00 pm - 7:00 pm.with the family present from 5-7 pm. Services will be held at Beautiful Savior Lutheran Church, 402 S. Baytree Ave, North Platte, NE, Friday, April 12, 2019 at 10:30 am. Interment will follow in the Brady Cemetery, Brady, Nebraska. Memorials may be given to the Beautiful Savior Lutheran Church, 402 S. Baytree Ave, North Platte, NE 69101.